The History of Blackwood – Interesting article in the Bacchus Marsh Express newspaper – 1896. Courtesy of TROVE – N.L.A. Accident to John Tenni and Benefit Concert for his family. By Margot Hitchcock, Historian for the Blackwood & District Historical Society. Blackwood. (From Our Own Correspondent.) A Concert was held in the Barry’s Reef Mechanics’ Institute on Wednesday, 27th ult., in aid of the widow and family of the late Thomas Tenni, who came by his death a few weeks ago in a rather simple manner. He was driving a horse team when he got a slight graze on one of his legs by being jammed against a log. Little notice was taken of it, and he went on working without much inconvenience for a day or two, when symptoms of blood poisoning began to show, and although he was then taken to the Kyneton Hospital the disease increased and death took place in a few days. The concert was well attended, and a varied and excellent programme was rendered, as follows :-Overture, piano, violin, and melodeon, by Messrs. Beale, Skinner and Walters; song, “Ever of thee,” Mrs. D’Alton; song, “The little Irish queen,” Mr. Warburton; song, “I am thinking,” Miss Broad; song, “Their heads nestled close together,” Mr. Rose; clog dance, Mr. J. Best; song, “The two orphans,” Miss Skinner; song, “Love’s story,” Miss Goodge; song, “The fatal wedding,” Mr. G. Armstrong; song, “When you and I were young,” Mr. E. Franzke; farce, “Runaway musketeers, or the underfed brigade,” given with good effect by the local comical comedy company. Part 2. Overture, piano, Mrs. Gribble; song and dance, “Pat O’Hara,” by special request, Messrs. Rose and Simmons; song, “Why must I say good-bye,” Mrs. Gribble; recitation, “The one-legged goose,” Mr. James. Terrill; duet, “O’er the hill, o’er the dale,” Misses Trewhella; song, “The Tipperary christening,” Mr. A. Rose. Song, “Killarney,” Mrs. Nelson; statue clog dance, by Messrs. Best, Simmons and Lightly. This was well done, but required the limelight to bring out the fill statuesque effects. Song, “As I strolled by the sea,” Mr. M. Giles; song, “Maggie’s secret,” Miss Goodge; clog dance, Mr. W. Ward; song, “Sentenced to death,” Mr. G. Goodge. The chairman, Mr. W. Byres, having proposed the usual vote of thanks to all those who had assisted to make the entertainment such a success, a well rendered farce entitled “Thumbs up,” by the comical comedy company, concluded the programme. The ball held afterwards was well attended and the dancing kept up till a late hour. The bachelors’ return Church of England social was held in the Blackwood Mechanics’ Institute on Friday, the 29th ult., and well attended, fully 70 of the young folks taking part in the round of parlour games usual on such occasions. The North Staffordshire company have had to discontinue work in their 70ft. shaft, as the water has become too heavy. The last work done was to break out 1 ton of quartz from the bottom level, which yielded 2oz. of gold. They are now starting a tunnel in the hillside, which will have to be driven 450 feet, and will give them something over 50 feet of backs below the bottom of their present shaft. The rainfall at Blackwood for the month of May was 4.37 inches, making a total of 16.26 inches for the first five months of the year. Mr. George Gallop, one of Blackwood’s oldest resident miners, died on Wednesday. His age was nearly 72 years, and he died rather suddenly, having been at work getting ready for another crushing of cement up to the end of last week. He has always been a hard worker, and had the reputation of having washed the richest tub of dirt ever got in the Ballarat district in the early days. But, in the ups and downs of a miner’s life, he had very little surplus of this world’s goods at the last, though I heard him say, no later than last week, that, as the result of his last cement crushing (noted last week) he was able to pay every shilling he owed, and have a pound or two in his pocket to spare. Mr. George Gallop was buried in the Blackwood cemetery on 5th June 1896, R.C. section M 39. The digger records have his age as 73 years, parents names unknown. A search of the Digger birth, marriages and deaths records show a Mr. Thomas Tenni born in Italy married Bridget Brady born in Ireland in 1880. They had the following children – Mable Oroslia Tenni at Barrys Reef in 1881 died age 11months, James Christian Tenni at Bullarto in 1882, Bernard Thomas Tenni at Bullarto in 1885, Thomas Oscar Tenni in Bullarto in 1887, Richard Ernest Tenni at Bullarto in 1888, Cicelia Evelyn Tenni born Bullarto in 1891 died age 8 months. 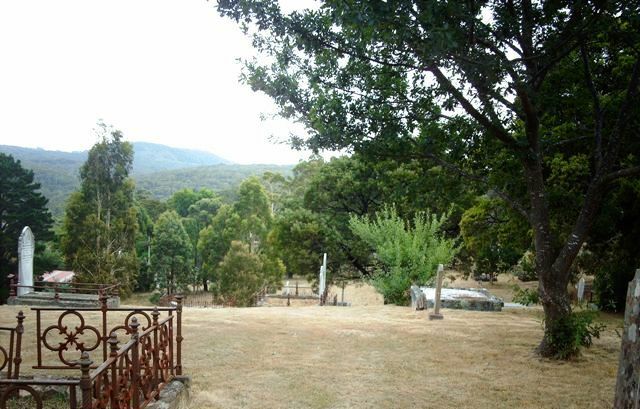 The father, Thomas Tenni died age 52 yrs in 1896 at Daylesford, father Giacamo Tenni and mother Orsola. The two little Tenni girls who died, are buried in the R.C section of the Blackwood cemetery, but have no headstones. Thomas Tenni died 8th April 1896.